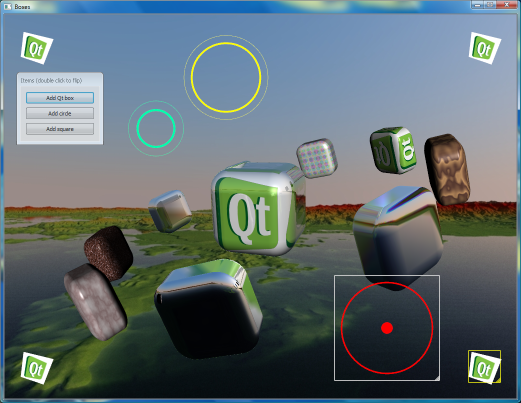 This demo shows Qt's ability to combine advanced OpenGL rendering with the the Graphics View framework. Dragging the mouse while pressing the left mouse button rotates the box in the center. Dragging the mouse while pressing the right mouse button rotates the satellite boxes. Scrolling the mouse wheel zooms in and out of the scene. The options pane can be used to fine-tune various parameters in the demo, including colors and pixel shaders.